UNCASVILLE, CONN. – May 22, 2017 – Barrett-Jackson is enriching its 2nd Annual Northeast Auction docket with rare and highly sought-after exotic supercars, including Lamborghinis, Porsches and Ferraris. The World’s Greatest Collector Car Auction® is set to once again stoke the passion of the collector car community with its premier automotive lifestyle event at Mohegan Sun in Connecticut, June 21-24, 2017. Included in this year’s docket of exotics is a Fly Yellow ’88 LamborghiniCountach 5000 Quattrovalvole (preview) that was custom-built for Lamborghini technician and collector Joe Nastasi. 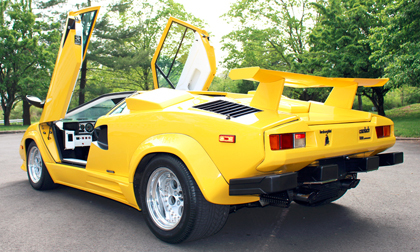 Lamborghinis that will be among the featured exotics during the Northeast Auction include a ’88 Fly Yellow Lamborghini Countach 5000 Quattrovalvole (preview). Built-to-order for the legendary engineering technician and collector Joe Nastasi and signed by Lamborghini legend Valentino Balboni, this supercar recently underwent an engine-out service and only has 8,500 original miles. Also among the featured Lamborghinis is an ’02 Murcielago (preview) that’s dressed in vibrant Arancio Atlas over black leather interior and a Super Fly Yellow ’91 Lamborghini Diablo (preview), a first-generation U.S.-spec car that has been regularly serviced and has 7,300 original miles. Porsches will also be well-represented during the auction and include a ’79 Metallic Black 930 Turbo (preview) restored in 2015. A three-owner vehicle with a little under 56,000 miles, this Porsche was rebuilt to factory 3.0 specs, and includes an impeccable catalog and photos of the restoration. Also crossing the block is a rare 1977 Porsche 911 Carrera 3.0 Targa (preview). One of just 365 built, the 911 Carrera features a 3.0-liter engine and 5-speed manual transmission with the proper rubber Carrera whale tail. Fresh off the production floor and usually only available for purchase via a waitlist, a ’17 Corsa Red Ferrari 488 Spider (preview) is the ultimate in Italian design and engineering. With more than $90,000 in optional equipment and powered by a twin-turbocharged V8 engine, this Ferrari is a true supercar that includes Daytona-style leather seats and power retractable hardtop. Click here to consign a vehicle for the 2nd Annual Barrett-Jackson Northeast Auction. For information on becoming a bidder, follow the link to Barrett-Jackson.com/Bidder/Home.